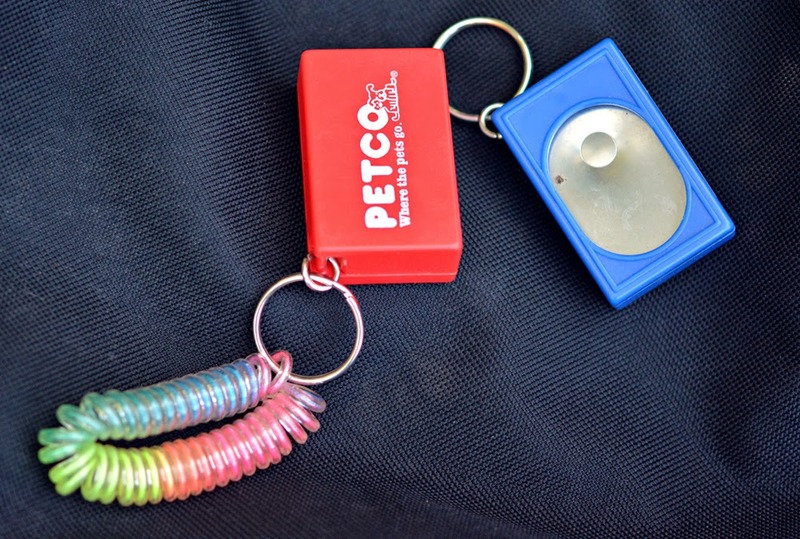 The Petco Dog Training Clicker is a basic box clicker. It comes in red, blue, and sometimes white, and includes a key ring. The stretchy wristband on my red clicker was purchased separately. As far as clickers go, it doesn't get much simpler than this. Push down the metal tab inside the box, get a giant click. This is a large box clicker, it is easy to use even with large fingers. The large size also guarantees that it emits a loud click, which can make training easier or more difficult depending on the dog. Pros: Cheap, usually $1.50. Reliable, I have never had one of these fail. The fact that the tab rests inside the opening also helps prevent accidental clicks while fumbling with treats and in pockets. This clicker is also incredibly loud for a metal tab inside a plastic box, which is useful when I'm working with Brisbane at a distance, in an area with a lot of background noise, or when I need to be sure he can hear the click while he is hysterically screambarking. Cons: This thing is loud enough to spook shy and sensitive animals. It also requires getting a thumb into the box to click it, which can lead to poor timing and missed clicks. Bottom Line: This is not my favorite clicker, but it's a close second. I have at least half a dozen of these because they are cheap, durable, and easy to find.